Starburst Beach House - Beautiful home one lot off the beach. •	One free beach setup (2 beach chairs, beach umbrella, table) for all reservations March through November. Starburst Beach House is located in the private gated community of Waters Edge, which adjoins Rosemary Beach on the west side. Waters Edge has its own private beach and, with only 34 homes in the entire neighborhood, the people density on the beach is low. As a result, Waters Edge is very popular with vacationers seeking the "perfect place" along 30-A. Starburst Beach House is only one row off the beach, and is conveniently located right next to the path to the beach. You can step out of the house and onto the path, walk the length of one lot (about 100 feet) and you are at the steps down to the beach. There are only two homes in the entire community with shorter walks to the beach. So it's easy and convenient to go back and forth between the house and the beach. This beautiful home has its own small private pool, which can be heated for a small fee. 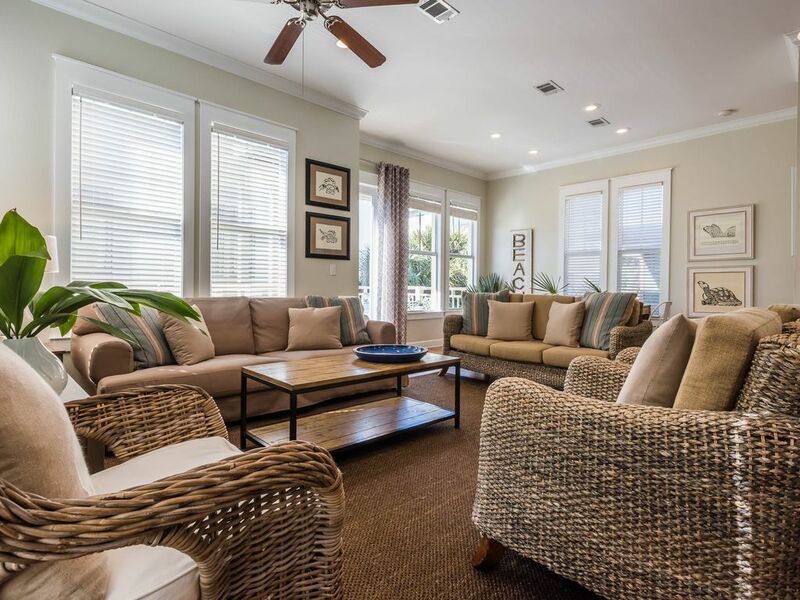 With five large bedrooms (3 kings, a queen and a bunk room), four and one-half bathrooms and 10-foot ceilings, this beautiful beach home is perfect for 12 guests to sleep and unwind comfortably. On the beach side of the house, you can enjoy the outdoors in the pool and sunbathing area, which is completely enclosed by a stucco privacy fence. The fenced-in area includes a large two-burner natural gas grill (no propane bottles to deal with) and a gate opening directly onto the path to the beach walkover. Starburst sleeps 12 guests comfortably: three kings, a queen, and a bunk room four full-length twin beds. Parking for three cars (one covered) on the parking pad at Starburst, with a 4th parking spot available on Geoff Wilder Lane close to the house (ask the owner for a parking pass). Saturday to Saturday rentals only. Non-smoking. No pets. We love the beach and have been vacationing in this area for over 25 years. This area is so beautiful and so much less crowded than Destin and other over-built areas. And the restaurant, shopping and golfing choices are outstanding. The small private gated community of Waters Edge provides exclusive access to a beautiful wide white sand beach. Because the Waters Edge community is small, the density of people on the beach is low. toilet, shower, 2nd floor master - large walk-in double shower. toilet, tub, shower, 3rd floor master - walk-in shower & large soaking tub. toilet, combination tub/shower, 1st floor Jack & Jill (shared by King and Queen bedrooms). toilet, shower, Bunk room has its own bathroom. toilet, Half bath off main living area on 2nd floor. One row off the beach, limited water view. In Kitchen: Both Keurig and Cuisinart 14-cup drip coffeemaker (uses size 4 cone filters). In 3rd floor sitting area: Cuisinart 12-cup drip coffeemaker (uses size 4 cone filters). Fully stocked with dishes, glasses (glass and acrylic), wine glasses, coffee cups, mugs, cereal bowls, etc. Main dining table can seat up to 10, with an additional 3 at kitchen island. Flat panel TVs in the main living area, the 3 King bedrooms and the Queen bedroom, all with streaming capabilities (free Netflix and Amazon Prime video, pay content available by reimbursing owner). High quality Bluetooth stereo speaker system (with subwoofer) for streaming music from your smart phone or tablet. Cable TV features several free music channels. Pandora available via streaming devices. A nice selection of DVDs is available for your enjoyment. 2nd floor beach side balcony has a large teak dining table that can seat 10. 2nd floor street side balcony. 3rd floor beach side balcony. Your own small pool in the private fenced-in back courtyard. The pool can be heated for a small fee. Nearby golf courses - Santa Rosa Golf Club and Sandestin Golf Resort are easy driving distance. We loved Starburst! And already booked next year! It truly lived up to the pictures and was perfect for our group of 7. The open concept kitchen, with living area, made a perfect space for evening games and morning breakfasts when not walking across the street for coffee or down a single block to the weekend farmers market. The house was perfect during our beach days, where we had the Starburst chairs waiting with umbrellas, when hanging at the beach. Rosemary beach is set up high on natural sand dunes, so having a house this close to the path and stairs was an unexpected bonus. We heated the pool, which was perfect for chilling after the beach. With 2nd story balcony off the kitchen, we enjoyed evening cocktails, prior to walking next door to the many shops and restaurants, only 2 streets away! Location is unbelievable and Hunter made sure our arrival was smooth and communicated everything prior to our arrival. Did I say location is perfect? We thoroughly enjoyed our time at Starburst! The house was very clean, spacious, and comfortable for our three families! The owner left detailed instructions and has taken great care of this property! It was super close to the beach and we appreciated having a dedicated chairs (2) and umbrella every day on the beach. You can't beat the location, we will definitely stay again here! Thanks so much! It’s a beautiful house and the owner is wonderful to work with! We only got to enjoy a very short stay in this perfect family house due to Hurricane Michael and mandatory evacuation but we’d highly recommend this house for family and for location! We will be back! This house was perfect for our large family!!!! Starburst was very clean , and very well furnished with everything you need to make our stay perfect! The pool was the right size for our grandchildren whom had the time of their life! The walk to the beach was very short . Overall our family had a great time and will be back!!! Great place! On the boardwalk, clean, nice rooms for everyone! We had a great time and the location and house was perfect!!!! Properly completed and signed rental agreement must be submitted to and approved by owner in order for reservation to be effective. Authorization for security deposit required. No special events. Must be age 25 or above. No smoking. No pets (either inside or outside) under any circumstances (violators risk eviction). Maximum occupancy 12 (plus infants in parent's bedroom). Saturday to Saturday rentals required (although owner may consider exceptions during off season). Contact owner for off-season specials.